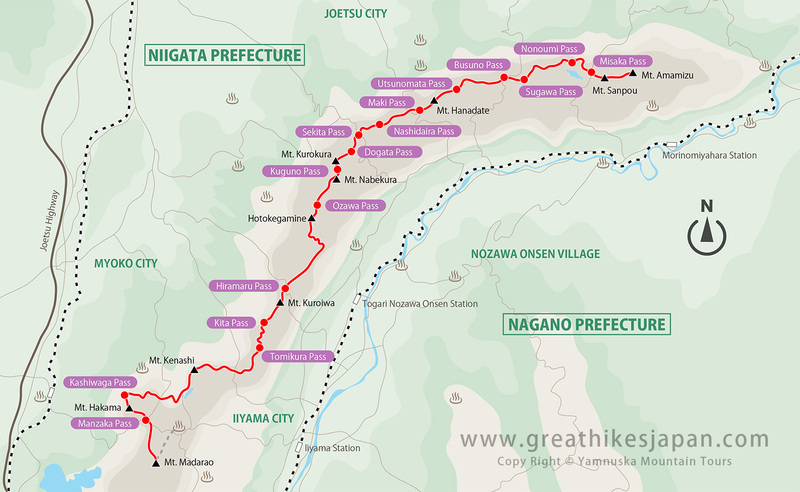 The Shinetsu Trail is a multi-day hiking tour that explores the Sekida mountain range between Nagano and Niigata Prefectures. It is Japan’s first long-distance trail designed after the Appalachian Trail in the United States and follows an ancient trail network. This trail is great for nature lovers who want to get away from it all and experience one of Japan’s few remaining wildernesses. It traverses old growth beech forests at elevations of approximately 500-1,200 meters with views of both mountainous scenery and the Sea of Japan. We meet in our hotel lobby at 6:00 PM in Nagano City for a tour briefing and a local Izakaya-style dinner. Instructions will be provided for the following day’s walk. We depart early this morning by bullet train from Nagano Station, arriving at Iiyama Station. Here we take a city bus to Madarao Kogen Hotel, our accommodation for the evening. We drop off our luggage and start trekking section 1 of the Shinetsu Trail from the Madarao Trail Head to Akaike Pond. The accommodation picks us up at the end of the day and dinner is in the hotel. We transfer back to Akaike pond this morning, where we start our walk for the day. From here, we walk to Wakui where our next accommodation picks us up. We have some free time this afternoon to relax in the onsen (hot spring) or walk around Togari Onsen. Dinner is in the ryokan. We transfer to Wakui this morning and start our day’s walk to Tondaira. Dinner is in the inn. Today we walk to the Sekida Gap. After picking us up, tonight’s accommodation takes us to the fields of a local farmer where we pick our own vegetables used in dinner. We transfer back to Sekida Gap this morning. From here, we walk to Busuno Gap and our accommodation picks us up. We go out to a local onsen (hot spring), where we enjoy dinner after a bath. After breakfast, we transfer to Iiyama Station. The tour ends here and your Nagano Ventures tour leader will help arrange your onward transfer. Iiyama Station is on the Hokuriku Shinkansen, with direct access to Kanazawa and Tokyo.